It is usually not necessary to buy your train ticket in advance if you travel with Czech Railways. You can simply buy tickets at the train station before your trip. You may want to get a seat reservation with your ticket to make sure that you can get a place to sit if the train is likely to be crowded, e.g. in peak commute times, such as on Friday afternoons, Sunday afternoons, and Monday mornings. If you plan to travel on a RegioJet or LEO Express train (they cover only certain routes), you will be buying a ticket for a particular seat. You will therefore be guaranteed a place to sit. 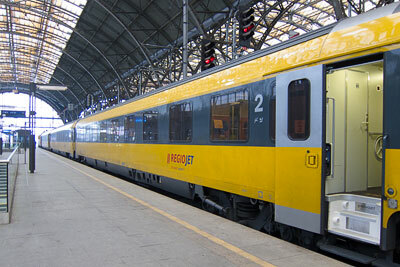 To buy a RegioJet or LEO Express train ticket, visit regiojet.com or le.cz.